He is absolutely killin' these crunches. Whaddya know, we have more in common with dogs than we thought. Canines willingly show up to a gym packed with humans to work on their fitness. 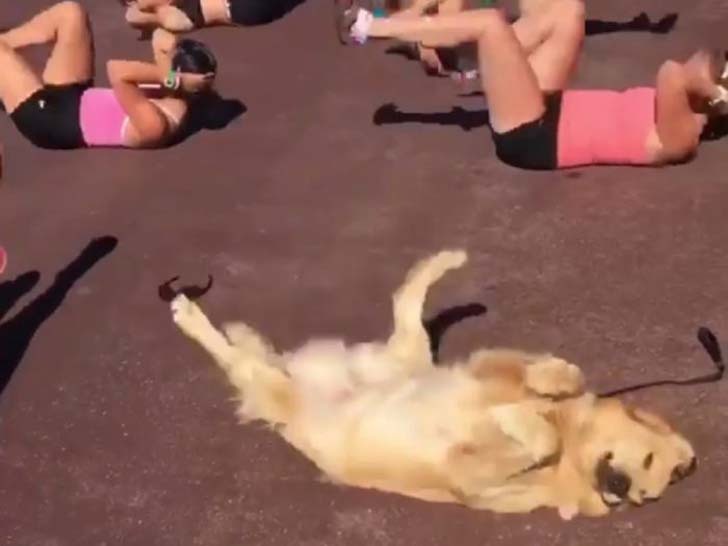 If you don’t believe us, just watch this golden retriever doing an ab workout. [post_ads]Seriously?! Who needs to buy badass workout clothes to get motivated for a good, old-fashioned sweat sesh when there’s a four-legged creature on the floor next to you absolutely killin’ those crunches? And he looks like he’s having SO much fun. Way to trick us into exercising, doggie. This canine working out his abs like a friggin’ beast is Riptide the Retriever, and he has no problem keeping up with the Stanford Women’s Crew team. And you thought beach season for dogs was all about sprints and playing in the waves. We cannot get enough of the clip of Riptide blazing through a set of bicycle crunches like he does it every day, and neither can the internet. The video has over 13,000 views and counting, and we’ll probably add another 1,000 or so to the total because watching Riptide work out his abs at a feverish pace is way easier and far more entertaining than doing it ourselves. Not only does Riptide understand the importance of staying active, but he also knows how critical is to wear protective eyewear on sunny days. That or he’s *really* feeling his social media fame. We don’t blame you, Riptide. Enjoy your well-deserved shine. Just give us time to join you for a workout sesh before you get too big for your britches and forget about all the little people.